“My class really enjoyed your study guide. I do not think they would have enjoyed the book as much without it.” - Trevor W.
What if you were a demon? What if your job was to thwart humans and to keep those humans from finding God? How would you do it? 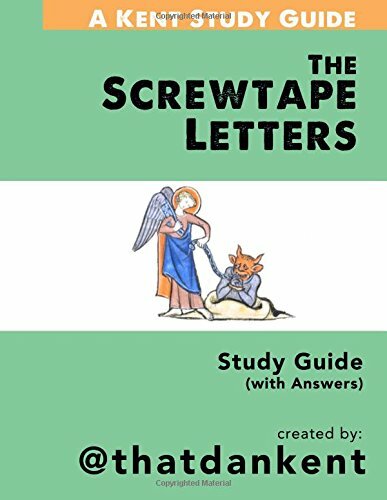 CS Lewis' devious little book "The Screwtape Letters" records the fictitious letters between two demons discussing this very issue. What the story is REALLY about is what makes humans succeed or fail in their search for God. It is about where, how, and why humans are weak. It is about the sneaky, unexpected parts of our lives that can either destroy us or lead us to fulfillment in God. This Best-Selling study guide and workbook unpacks the major lessons Lewis emphasizes and applies these lessons to our daily lives. The Best-Selling Kindle study guide is now available in a physical workbook format too. Upgrade to get study guide with answers! This is where we'll email your study guide.